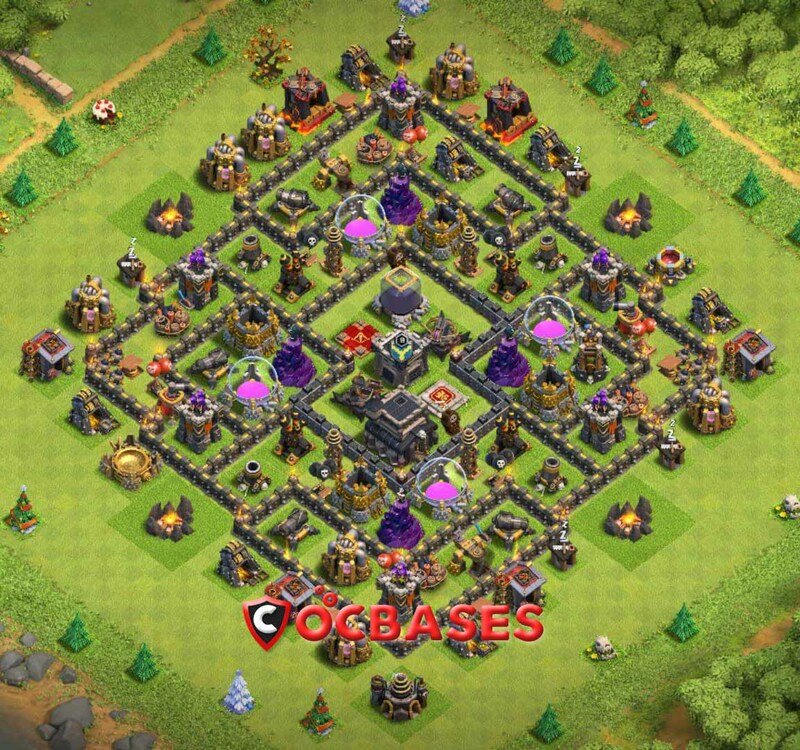 Centralized clan castle and x-bows placement. Distance between each air defense placement. Two double giant spots to defend against combination of hog attacks. Gobowitch (Golem, bowlers and witches). Lavaloons (lava Hounds and balloons). 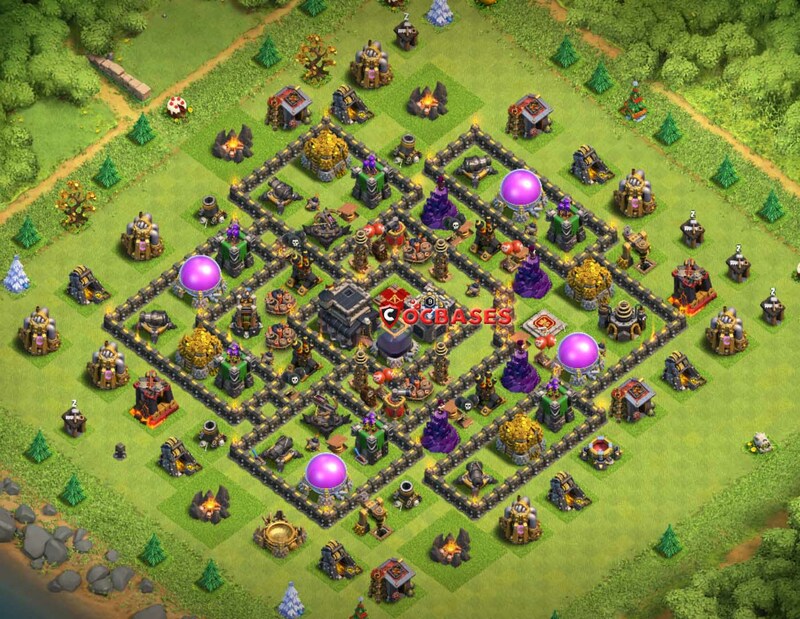 The second layout design has the centralized town hall that is very close to the clan castle. 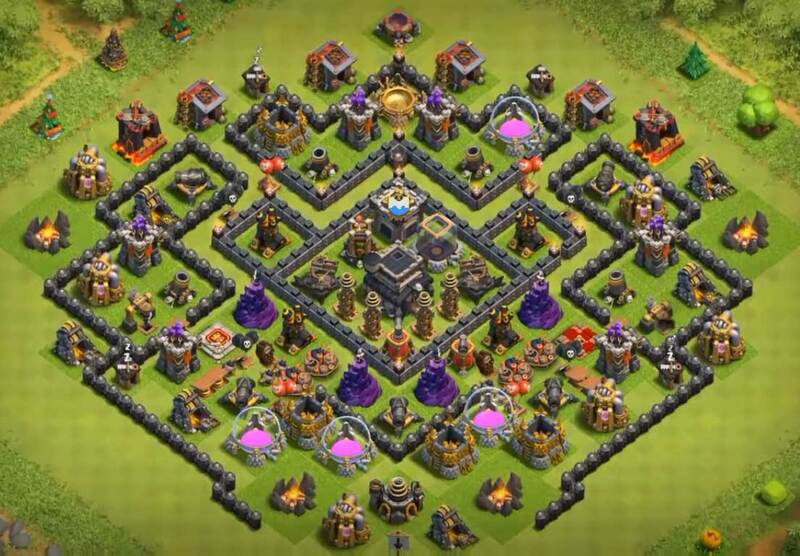 This th is surrounded by wizard towers, Tesla’s and x-bows and clan castle.This design is an anti valkyrie village that air defenses parallel across the layout. 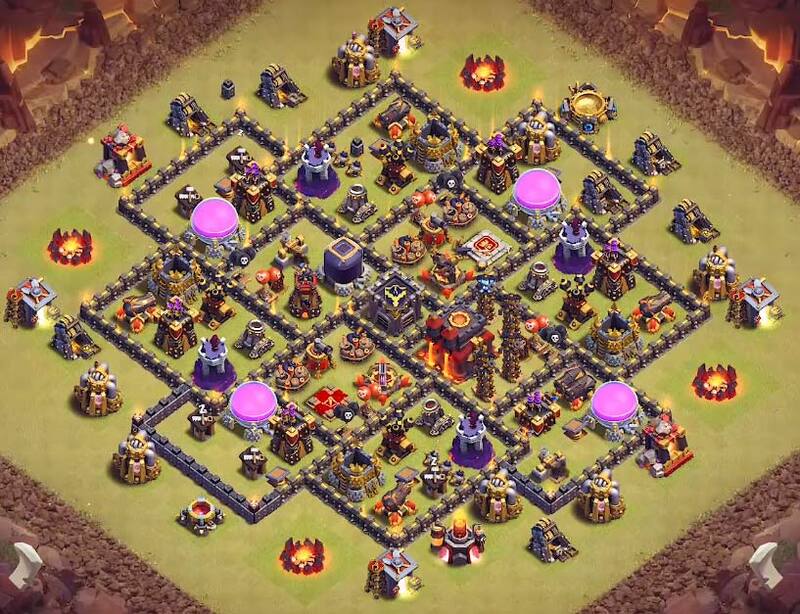 If we look at some unique things of this layout are the placement of barbarian king and archer queen . The air sweeper is in the center which defends air troops very well. Now this is an interesting level 9 layout design that can defend various opponent attacks. In this village we have included latest addition geared cannon. This level 9 layout has excellent placement of traps with open compartment inviting ground troops to come inside. this is one of the unique design in the the entire article. 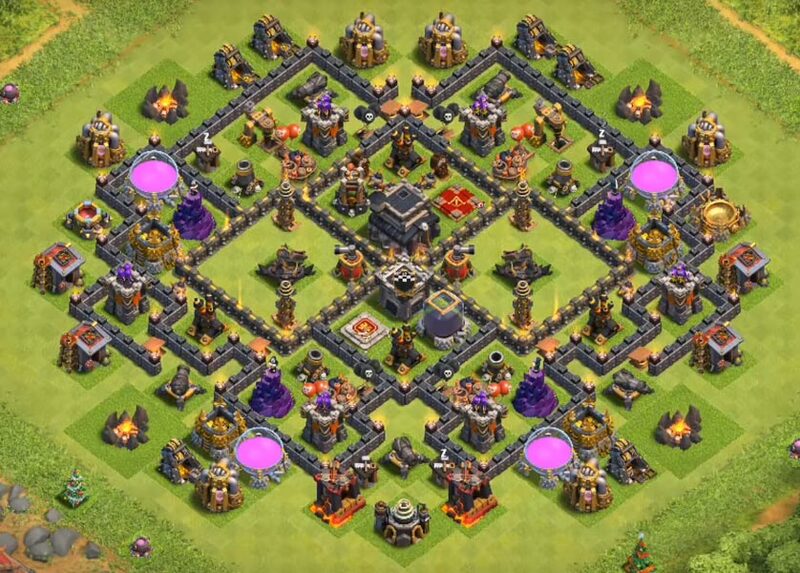 This is one more great clash of clans town hall 9 defense design. 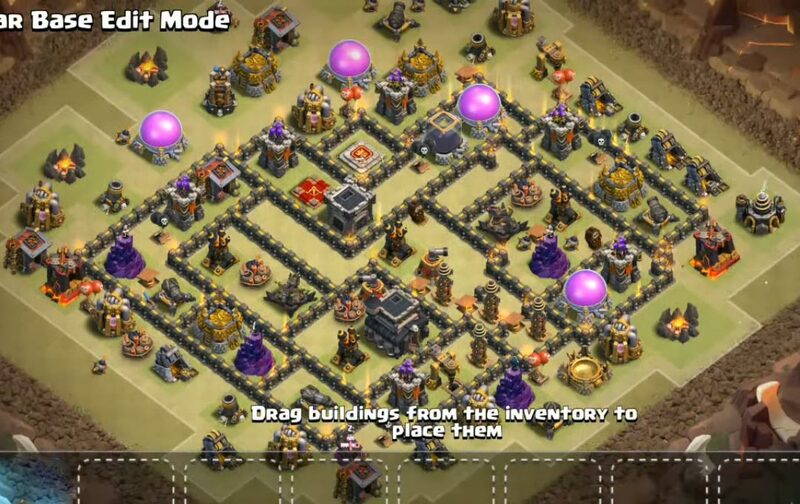 As you can see this layout has town hall outside all the walls. The main thing is that this is an anti 3 star layout design that is good at defending ground troops. 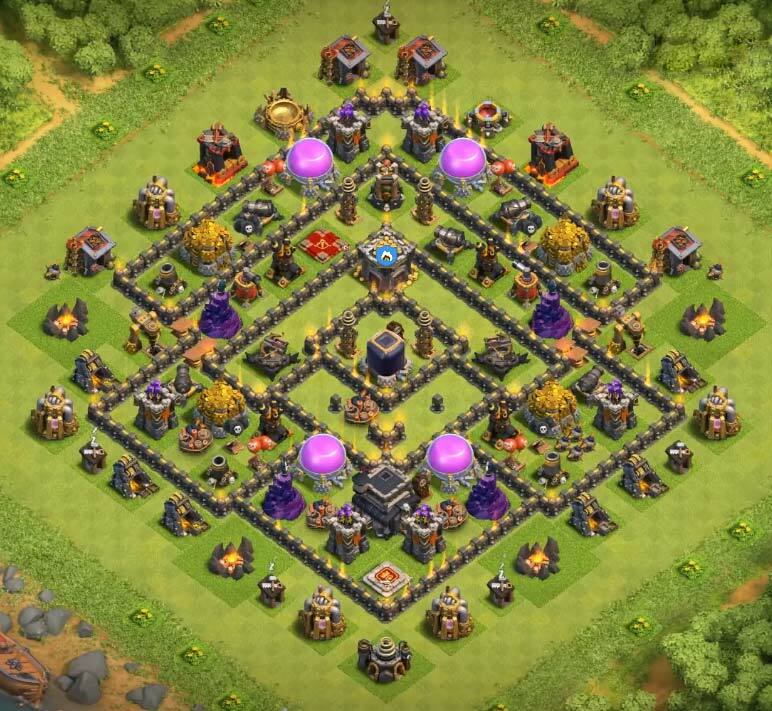 well look at this design which has geared archer tower close to town hall and you can easily understand that this is a newly designed town hall 9 design.I would recommend you to switch your town hall accordingly into the center of the layout if you want. this is an anti 3 star war design that is designed to withstand against bowler hogs and air attacks. 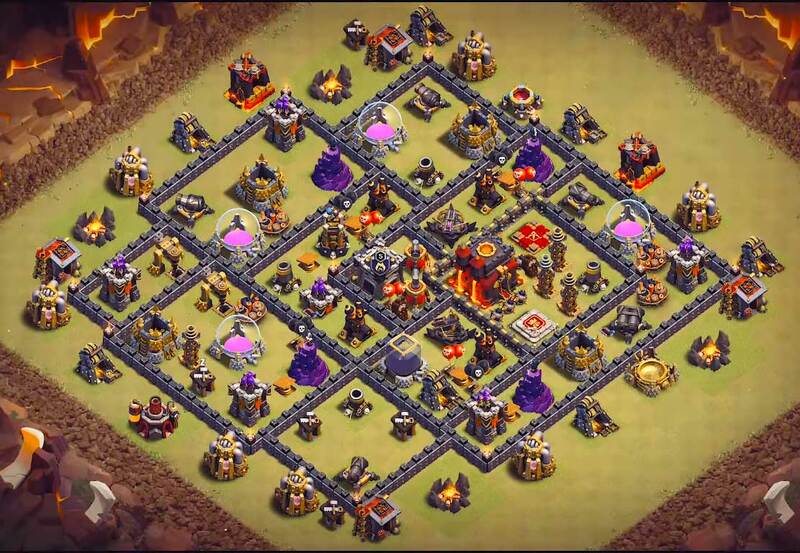 I already said you this map can defend air attacks mainly lava loons that is so common at town hall 9. Observe the placement of air defenses that are well distributed on four sides of the layout to defend against air attacks. This one more excellent village map plan. 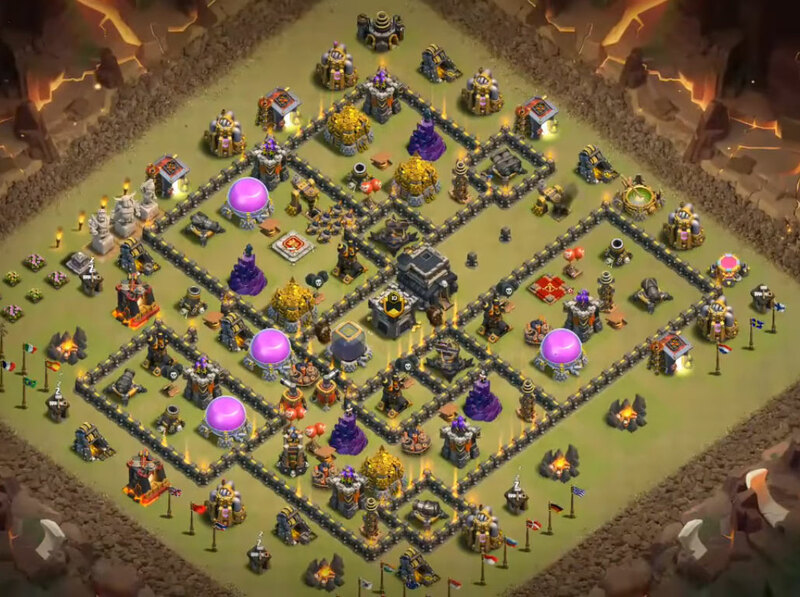 These layouts are some of the good town hall th9 farming 2019. 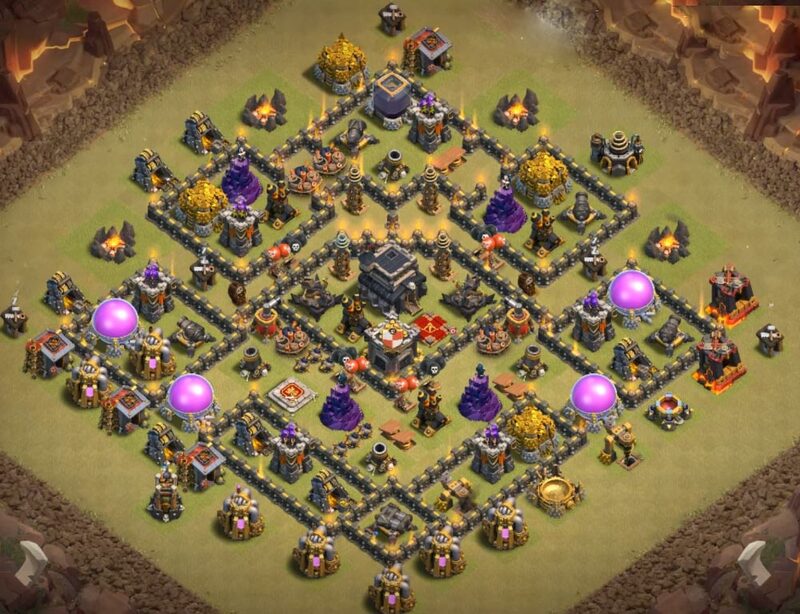 As you can see the first design has a town hall in the center of the layout, surrounded by x-bows bomb towers and heroes. there are three other different compartments wherein the other defensive buildings are present. The second compartment from the center has gold storage’s and the Elixir storage’s are placed right next to the gold storage’s in other section of walls. The outer compartment is composed with the archer towers cannons and Tesla’s. whereas the other non-defensive structure’s such as elixir collector and gold mines are surrounded outside the walls which make a good farming village overall. 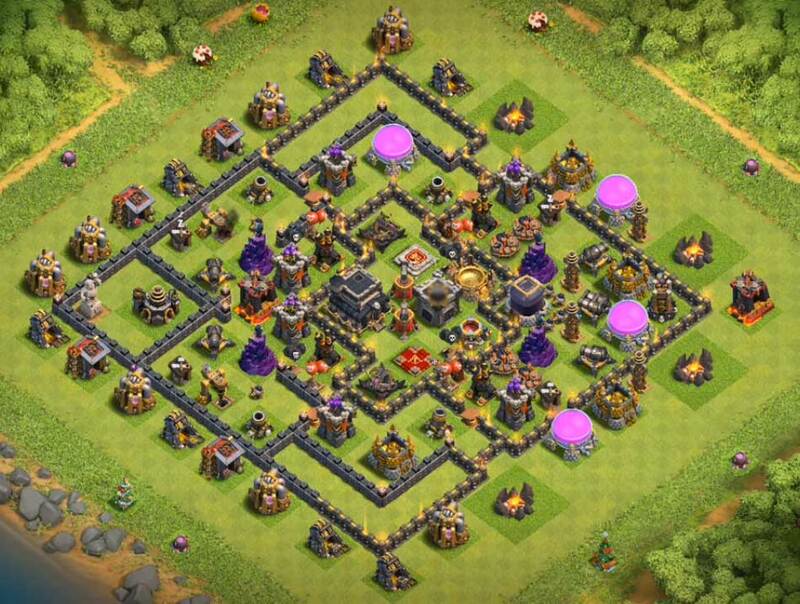 The above village is also great for protecting dark elixir. Next, we are up with the hybrid designs with bomb tower anti everything. These can be used for both war and farming. so the similar to that of a doughnut. 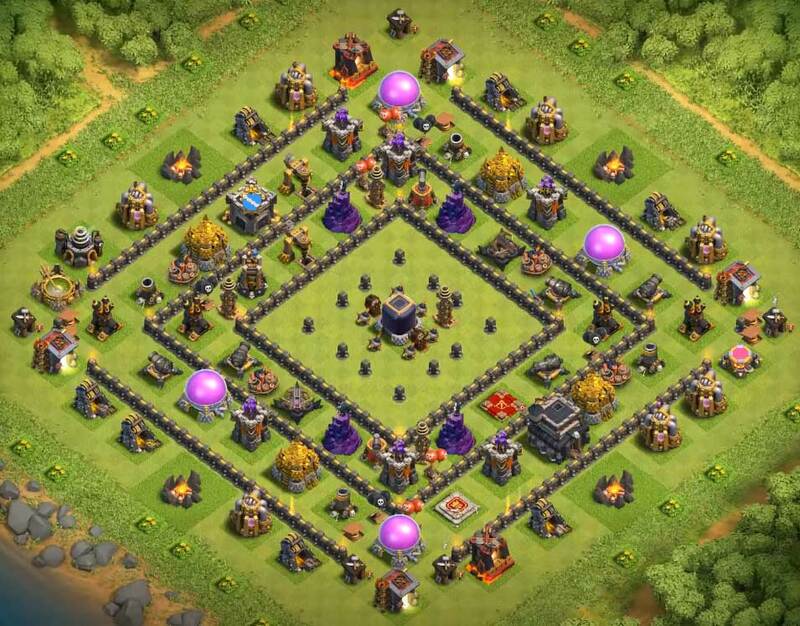 The central core compartment is filled with the tesla’s, x-bows and heroes that are protecting dark elixir storage. 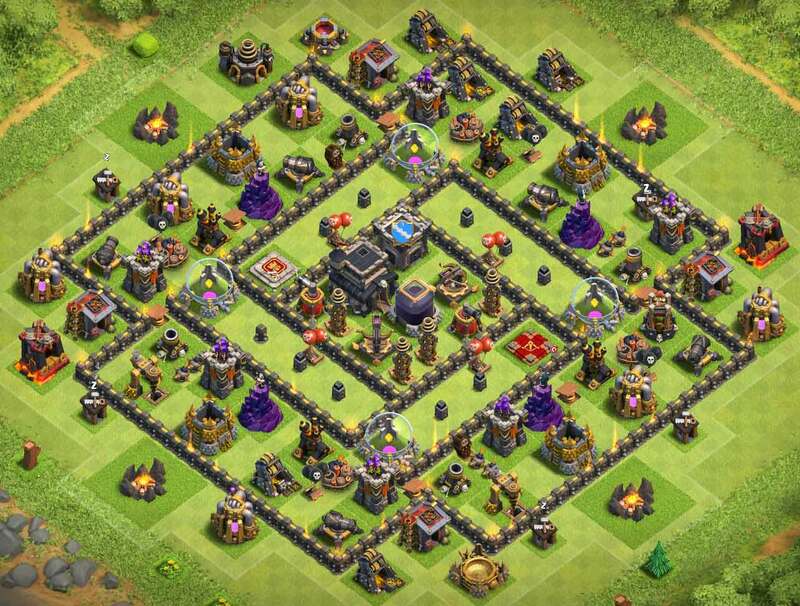 The first town hall 9 layout I’d love showing you is a good war design that protects the heart well with both the Archer Queen and the Clan Castle inside it. I suggest with a Dragon over the Clan Castle, and lots of competitions will observe a massive disappointment. go with giants they will be helpful for farming. walls are costly go with the defenses first. 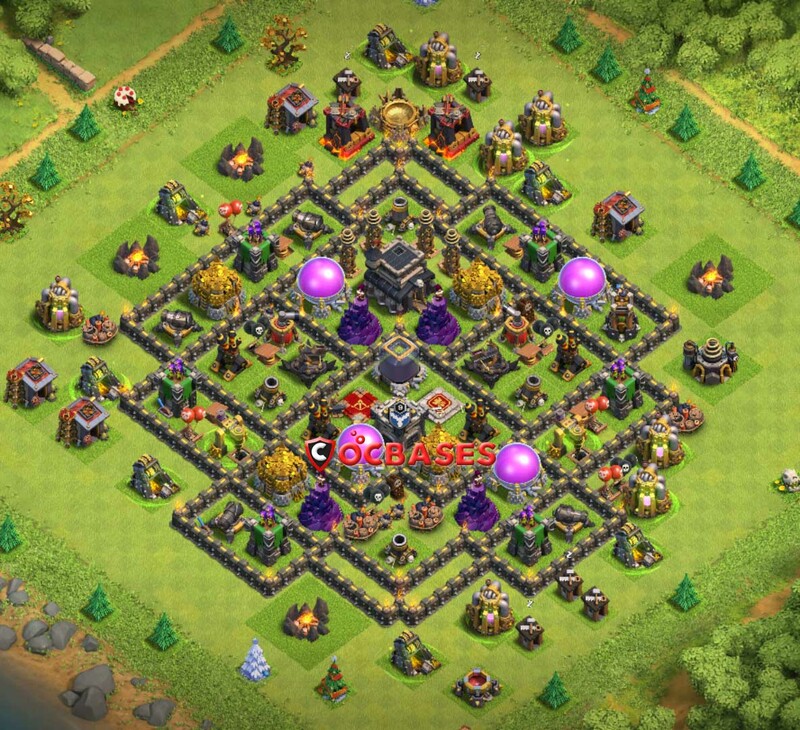 Any recommendation for a trophy and dark elixir farming base. If you do,plze send me a link and i will be proudly happy. Als0, you put so much effort into making these bases. I am thankful for your work.